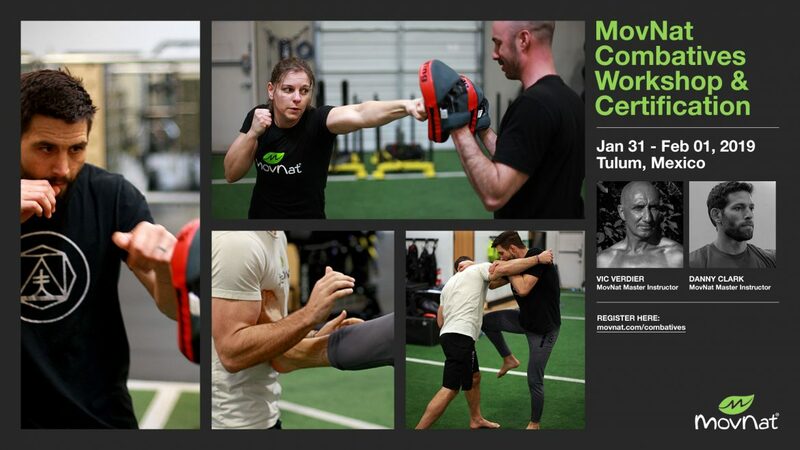 If you want an insiders perspective on the MovNat Combatives course, you’re in for a real treat. Below, you’ll find an up-close-and-personal interview with five people who attended various MovNat Combatives courses. These are men and women from totally different walks of life; some with previous experience in martial arts and self defense methods; others with none at all. In this interview, they provide an up-close and personal look at the MovNat Combatives program, including some key lessons and takeaways they got from it. Each of them has a very unique perspective, and you’ll learn a lot from the collective wisdom they share. Is this course better for experienced martial artists or people with no training whatsoever? Can you really learn how to defend yourself in just a couple of days? How to put the fear of God into MovNat Master Instructor, Danny Clark…just in case you were wondering! If you’re thinking about attending the MovNat Combatives course, what follows will give you a very good idea of what to expect. But even if you have no interest in coming to a course, you’ll still learn a lot about how to protect yourself, along with many other things that come up when confronting this topic. Even if you only glean one golden nugget of advice that will help you and your loved ones stay safe, reading this tome of knowledge will be worth your time. And there are literally dozens of golden nuggets in here. You’ll find a blend of practical and actionable tips along with some deeper insight concerning self defense. There’s something in here for everyone, and my hope is that you glean a few things that equip, inspire, and encourage you. So, do yourself a favor, grab a glass of your favorite beverage, and soak up the stories and advice from these amazing people. We’ll start by getting to know them, and then we’ll get to the fun stuff! Could you tell us a little about yourself, including your training background? 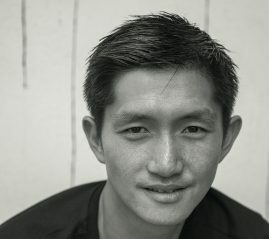 Danny: I’m MovNat’s Performance Director, COO, and one of our Master Instructors. My background includes 18 years of wrestling, 10 years of Brazilian Jiu Jitsu/Sambo, 3 years of Judo, and 1 year of Muay Thai/American Boxing. I wrestled in college and achieved the rank of brown belt in BJJ, Judo, and Sambo. I also trained for and competed in amateur MMA for a brief time period. My highest achievement in competitive sport was a bronze medal at the UWW (formerly FILA) world grappling championships at 84kg. Academically, I studied biology and archaeology in college before transitioning into exercise science. I was a personal trainer and gym owner for 10+ years before I joined the leadership team at MovNat. Christa: I’m Christa. 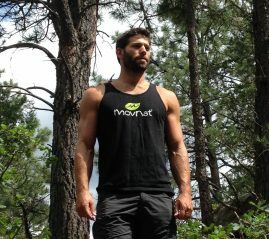 I’m a chiropractor, natural movement nerd and Operations Director for MovNat. I’ve been a rock climber, trail runner and skier, with most of my training being geared toward being better at those sports – until I found MovNat and saw it as a holistic, life-training system. Not only does MovNat incorporate fitness & strength training, but alignment & mobility training that is too often lacking in modern fitness systems – and a big reason why people end up on my table with back pain and other issues. From the beginning, I loved the movement ‘domains’ introduced in the Training Manual – Locomotive, Combatives & Aquatics. That really highlighted to me the comprehensive, evolutionary approach of MovNat training. I had zero experience or background in self-defense before taking Combatives, but was inspired to take it as a logical “next step” in my natural movement practice progression. Chris: My name is Chris Redig. My love of Natural Movement is rooted in a love of adventure. Traveling, SCUBA diving, hiking and enjoying nature motivates my training. Six years ago, I started to consistently train – mostly calisthenics. Three years ago, I switched to gymnastic strength training. The results were good, but there was always a gap between my passions and my training. In 2015, I read Natural Born Heroes by Christopher McDougall. From then on, MovNat was on my radar. In 2018, I finally pulled the trigger. The L1, L2 and Combatives certifications were offered back to back in Albuquerque. The timing was perfect. So, I took the jump. To be honest, MovNat Combatives felt a bit risky. My only previous self-defense training was a year of Krav Maga over 12 years ago. I felt pretty unprepared, but I knew I’d hate myself, if I passed up the opportunity. Zong: My name is Zong. I was born and raised in Vienna, Austria. Both of my parents are from Taiwan. I may look like I have a martial arts background, since I’m Asian looking. But the only experience that I have is 3 years of WuShu between the age of 6-9 years. I’m an all-arounder concerning sports. I played organized basketball for most of my life, and a couple of years of soccer. I participated in a bunch of triathlons and marathons, too. I used to coach semi-professional basketball teams aged 8 years until senior teams for 19 years. Besides that, I also studied sports science at the University of Vienna. In 2006, I started working with patients at a private practice where we trained with patients in a medical training center coming back from all different injuries. Since then, my focus has been on training therapy. In 2009, I joined a medical center (www.mza.at) where Dr. Martin Gruber, a orthopedic surgeon was the owner. In 2016, a team that was born out of Dr. Gruber – 4 sport scientists and physiotherapists, and myself – founded “Sporthalle Wien”, which is a training facility focused on functional training. The main focus of the group courses are MovNat classes combined with conditioning, strength, mobility and boxing classes. Next to that we have a medical training area for patients coming out of physiotherapy and doctor’s treatments. Danny, tell us about that time at your MovNat Combatives course where Christa put the fear of God into you. Danny: What a vivid, visceral memory! 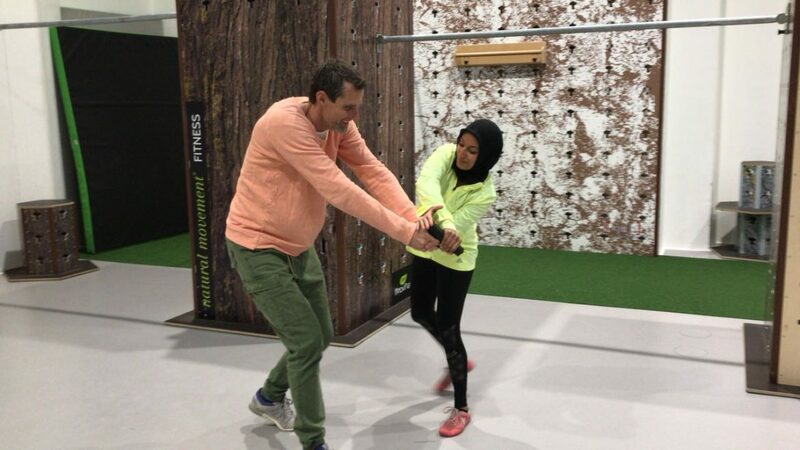 In a self-defense test we all did at the conclusion of our training, each participant is subject to some (moderate) contact followed by some intense activity to stimulate the stress response of a real world situation. The “intense activity” following the contact portion was hitting some pads I was holding for a set time period. As it turns out, the ferocity and intensity at which each participant hit the pads was highly variable – and certainly not linked to size or gender. Christa came charging at me like an enraged rodeo bull and nearly knocked me over with her first few blows. I quickly adjusted my position to account for the extra hard blows. But to my surprise they continued to get harder as she pressed forward. I was close to being pinned against a wall – which would have become a precarious situation for me given her state of mind – when Vic called time. I honestly think he cut this section of her training a bit short to save my life (or at least my ribs)! Christa: LOL! “Though she be but little, she is fierce.” And MovNat Combatives is great way for any women to learn to be more fierce! :-) But I wasn’t actually seeing Danny or taking it out on him. I was actually really scared about doing “the Stress Test.” I was the last to go and actually spent a lot of time trying to figure out how to get out of doing it. In the end, I put on my Big Girl Pants, did it and I’m glad I did because I now have a better understanding of what I can endure. Vic asked us to stay present & aware during the test, to resist the temptation to mentally go to a “happy place” to try and block it out. I used anger to focus my attention and stay present because it was the strongest emotion I could call up in that situation. I yelled my way through the test (thanks to Vic for being a good sport & not taking it personally) and when I came out of it to strike, kick, and punch in an all-out effort for a minute, I let all that anger out on the blocking pad to keep me going. It was sheer coincidence that Danny was the one holding the blocking pad. Danny: Quite simply, because its way better than you’d expect. It’s MovNat’s practical, real world approach to movement applied to situational awareness and self-defense situations – which is way, way different than sport. As a lifelong martial artist, I thought myself quite competent in a self-defense situation. But Vic’s expertise allowed me to go through the process of realizing I have far less competence in the complex “arena” of the real world than I imagined. This more truthful appraisal allowed me to (a) understand how to avoid conflict through awareness, presence, and action and (b) expand my skill set of actionable movement to be effective, efficient, and adaptable to endless real world scenarios. As a result, I feel 1000% more confident in my ability to translate my skills into self-defense; chiefly through better avoidance of highly dangerous situations. For the non-martial artist, it’s a zero-fat approach to situational awareness and self-defense. If feeling more confident outside the padded walls/floors of the dojo is your primary goal, MovNat Combatives is the perfect entry point. Christa: Why MovNat Combatives? Because I wanted to learn the real meat of it. It seems to me that with a lot of modern martial arts, there’s a lot of routines, rituals, sequences and such that you have to learn before you get to the meat & potatoes of what you are going to need in a real life situation. There is value in that, but it just doesn’t interest me personally. With Combatives, Vic distills a lifetime of learning and training in to what actually works in real life scenarios and what can be easily trained – and remembered – in an emergency situation. A cool arm bar or big roundhouse kick might look cool in a movie, but might not be practical in real-life. It has to be simple & effective enough that even your grandmother could learn it, remember it, and do it, if necessary. That’s not to say that a weekend training is all you need to be prepared! It still takes regular practice & training, but Combatives has given me a lens to focus and scrutinize that training on the most relevant and practical skills. Chris: My wife and I love to travel, especially to exotic locations. We met at a bar in Honduras. On a few occasions, the possibility of violence seemed likely, and I didn’t feel very prepared. There’s a big difference between memories of occasionally sparring in a gym and being followed down an alley in the third-world. For a long time, I’ve wanted to fill that gap in my skills. I was looking for something practical and something that I could teach my family. I wanted something simple enough to remember and use in an emergency. I watched the video promotion, read the descriptions and saw that Vic Verdier and Carlos Condit were the instructors at the course I was interested in. It looked like exactly what I wanted. Sara: MovNat works from the ground up. I chose MovNat Combatives for the same reason. I am a tiny person who has absolutely no aggression. I felt if I ever needed to defend myself, I wouldn’t even know where to begin. I needed progressions in very easy to follow steps. MovNat Combatives was exactly that with the progression of phases of action. I loved all the practice with real life scenarios. When adrenaline is pumping and you’ve got tunnel vision, you won’t have time for complicated martial arts moves; only the simplest techniques will be most useful. And MovNat teaches efficiency because every second counts when you’re in a life or death situation. Zong: As a great fan and believer of the MovNat method/philosophy, the MovNat Combatives part was a must. I was curious about the self defense part, that MovNat had in it’s program. I also wanted to get more knowledge about combatives in order to include it in our MovNat classes. Tell us about your experience at the MovNat Combatives event. Christa: I’ve never struck, kicked or punched so much in my life – especially with guys. When sparring and practicing, a couple of the guys had to tell me to take it down a notch – it was just practice and no one need to get injured. Some of the guys had trained in martial arts or BJJ before and I really felt the need to come at them strong to keep up. I thought it would be awkward sparring with the guys as the only female in the class, but in the end, I found that was really great practice to go up against them. For one, it’s much more realistic. If I ever needed to use this stuff, it would be against a male assailant. But also, many of the techniques are not about overt strength, but how to use your strongest points against their weak spots. Striking my elbow into their nose for example; it takes little strength on my part and no one, no matter how strong, is going to be un-phased by an elbow strike to the nose or eye socket. Overall, I felt the experience was really empowering and I wished more women would come out and take it. I think it’s a great foundation for women to use to learn awareness and how to protect themselves. Chris: Three elements really stand out. First, we spent a lot of time analyzing violence. What is it actually like? What happens to your mind and body? What do victims have in common? What tactics work? By the time the course was over, I felt much more confident that I could spot a violent situation before it occurred. I also had a much better idea of what to expect during a violent encounter. Second, we practiced and rehearsed scenarios with as much realism as possible. We drilled scenarios in the parking lot, in cars and in a locker room. We used dummy knives, rubber guns and even a stun gun to make it real. Third, I walked away knowing how to continually improve my self-defense capabilities and teach others as well. This allows me to not only improve my own self-defense capabilities, but also teach my clients, family, and friends. 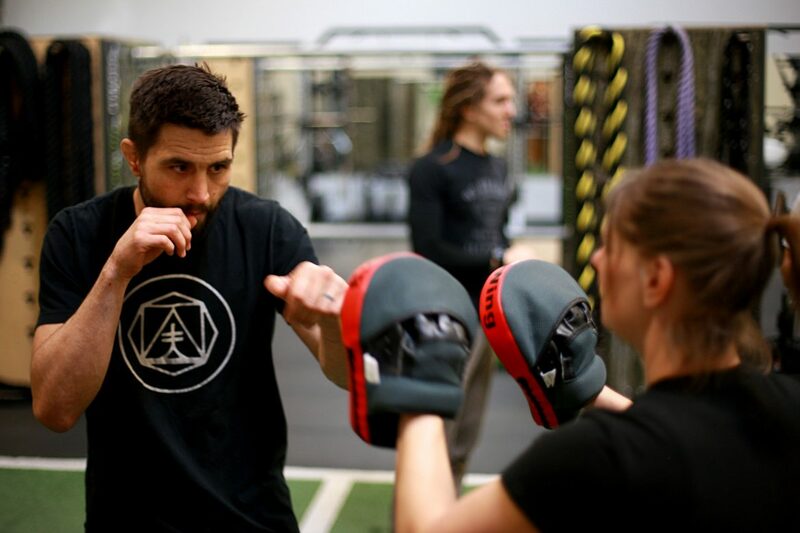 Sara: MovNat Combatives started with the very basics, how to NOT need to defend yourself by being smart and pro-active, and then slowly progressed to providing tools and moves for protecting yourself. Vic is an amazing coach. He is so tough and looks like he could maim someone without even blinking, yet he teaches in such a simplified manner, perfect for beginners. He makes even a beginner feel competent and empowered. There was no air of superiority, and not once did I feel like I didn’t belong in this certification. He kept joking even a 25kg person can do it, looking right at me, and I really could do it all! Zong: Before the event I was a little skeptical how it was possible to get to know a concept of self defense within 2 days, where in other self defense systems you need years of training in order to make it applicable in emergency situations. I came in with little information about what topics would be covered. From my Vienna team, one very experienced martial artist joined the clinic. I was really curious about how my colleague would respond to the combative clinic. The opening was decisive by Vic. He made it clear in a simple exercise what the weekend was all about. For me, as a rookie with almost zero experience concerning fighting and self-defense all the things and topics that were covered made sense to me. It was so compact starting from the beginning and all made sense. The so called “5 minute rule” explained by Vic made it all clear to me. If a technique is not learned in 5 minutes you need almost 5 years in order to make a technique work and applicable. So, all the things that we learned were for everyone. How did your previous experience with MovNat and any martial arts / self defense disciplines come into play during the course, if at all? Danny: Having a martial arts background gave me more confidence and comfort with contact. As it turns out, contact was a very small part of the course though. So really, it just made me less hesitant to participate. The contact portion was both a reinforcement of what I knew, a prioritization of what’s actually important, and an expansion of real-world “dirty” (read: effective) techniques to shift my focus from “winning” to maximizing survival and avoiding injury. Chris: I had just finished my Level 1 and Level 2 MovNat certification, when I started the Combatives course. In general I was moving better than ever. I appreciated the new movement abilities, but it probably wasn’t necessary for the Combatives course. It just made everything a bit easier. Similarly, my previous experience with Krav Maga made some of the striking and ground movement easier to digest, but again it wasn’t necessary. This was a pretty big relief, because I definitely came into the course with little previous experience. Zong: It was good to know what MovNat and its philosophy was about and according to what system MovNat is structured. That helped a lot to understand the essential parts of the combative program. All things learned and presented were complementary and useful. What did you learn that you weren’t expecting? Did you learn or experience anything completely new? Christa: I like to say that I learned how to punch from Carlos Condit, because I basically did. 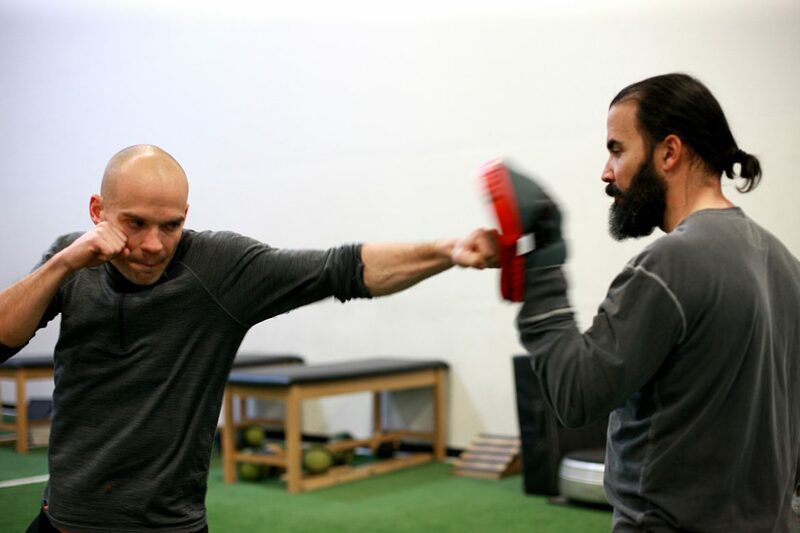 I thought I knew how to punch, more or less, before the course, but I was definitely missing some of the subtleties and nuances to make it truly effective – and not injure myself in the process. I also really appreciated the morning that Vic devoted toward teaching about awareness and predator mentality. You win 100% of the fights you avoid and often criminals/predators are looking for easy marks. People who are distracted & unaware. We talk about situational awareness in MovNat frequently, particularly in regard to the environment, but Combatives is another really crucial way to practice and develop awareness. It’s a vital skill that could be the difference between life and death for someone in certain situations. Evolutionarily, it was even more vital to survival, and I think there is a part of us that still needs to practice that level of focus and sensory integration today. Chris: I learned two completely new things. First, I had never learned how to train and prepare the mind for unexpected violence. As a rule, if you experience a violent attack, you have either no warning or very little warning. In such a situation many people shut down and quit the fight or they respond slowly and ineffectually. The brain doesn’t have time for complicated problem solving, so you need to train for those moments in advance. Through the course we learned how to use scenario drills, stress inoculation drills and instinct-driven reactions to train our minds for those moments. Second, we learned how to avoid looking like a victim. Predators focus on easy prey. If you don’t look like an easy target, you are much less likely to be attacked. As I’ve traveled, I’ve picked up on many of these principles, but the course presented them in a very organized and actionable way. It’s great having a system to employ, especially when you’re in a place you probably don’t belong. We even learned a drill to improve our skills. Sara: Everything was new to me. I wasn’t expecting it to be so simple and easy to learn and implement. I figured it would be a big, strong mean-looking man trying to teach me his fancy complicated moves that I wouldn’t be able to replicate. I did not expect to be able to apply the moves so easily. 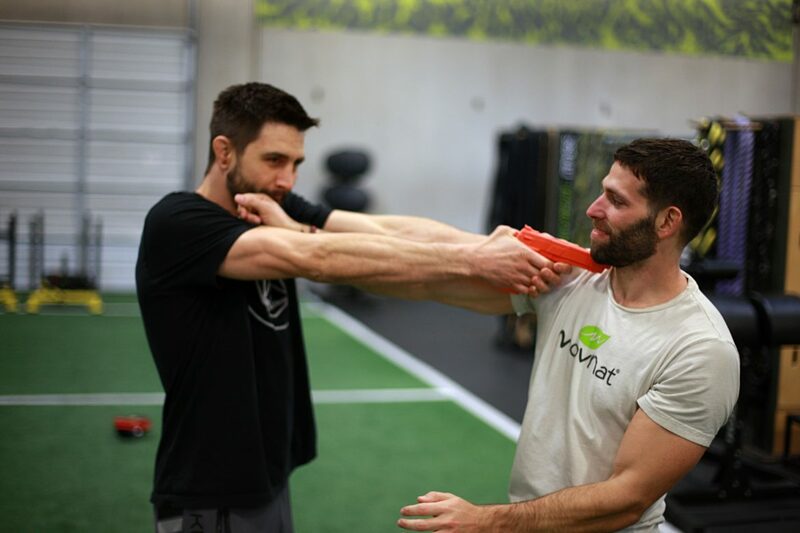 I had assumed self defense would be all about strength and aggression, but Vic explained that its all about being effective, efficient, and adapting to respond to your situation swiftly. I was definitely not expecting the stress test would involve the use of stun guns! But I also discovered they don’t hurt too bad, just enough to get me up off the floor super fast! I was so happy I was able to get up and could still fight off my 3 ’attackers’. I was laughing as I got away. Vic said he’s never met anyone who laughs after being stun gunned, everyone swears. I’m sure he still remembers me for that! Zong: I learned a lot about being aware of a situation and trying to think like prey as Vic would ask us to do in order to understand how to avoid dangerous situations where people would expose themselves to be mugged or robbed. The profiling part that we did where we analyzed a public festival with all its visitors was a fun part where we were putting theoretical topics into practice. For someone who has very little, if any, self defense training, what is the value of a course like this? Christa: There is a TON of value in this course! For one, anyone who is into survival training, awareness is your most important skill – before fire, shelter, foods, navigation, etc. Just because the context of the dangers around you may have changed with modern life, doesn’t mean that we don’t still need to be aware of those dangers. Knowing how best to use your strength against their weakness is critical. There will always be someone stronger than you, so you can’t rely on brute strength for safety. This is especially crucial for women who might find themselves up against a stronger, male assailant. Learning how to maintain focus & awareness in stressful situation – and not give over into tunnel vision is also huge for being able to use every possible advantage to get out of a dangerous situation alive and relatively whole. Chris: Self-defense is an extremely practical skill. It’s one of the oldest and maybe one of the most important movement skills. This course will give you a very strong foundation of self-defense. And the skills you learn don’t require enormous amounts of time to perfect and maintain. It’s simple, dirty and useful. You can walk in the door on day one with no previous experience and still benefit enormously from the course. Sara: If I can do it, anyone can do it! I’m a tiny 5 foot 2 inch human – not aggressive at all – and I smile way too often. I’ve always lived in very safe neighborhoods so never really thought about self defense. I tried a self defense workshop prior to MovNat Combatives. At the end of the workshop, the coach’s advice to me was learn to run fast, because I just don’t have it in me. And that I needed to smile less and take off my hijab so I’m not a target. As I walked out that day, I realized I need to learn to protect myself and teach my three children. So, Vic had his work cut out for him when I showed up for his course. I warned him as I walked in! Zong: My philosophy is that no matter where you go and what you know, you can’t know enough. So, I think for people who are experienced in martial arts, it is still a good course. He brings together the best techniques from all the different areas useful and learnable for everyone. Also, the “5 minute rule” makes it easy for people with little or no experience. Also the profiling and theoretical parts were great to hear and might save someone from a dangerous situation. Do you feel more prepared to protect yourself from violence in the future? Christa: I do feel more able to protect myself. Mostly just by being more aware of what is going on around me, paying attention to people, noticing escape routes, and carrying myself in a ‘hard target’ way versus ‘soft target.’ I definitely feel more capable and empowered since Combatives, and I’m planning to continue to practice with some ninjutsu/scout training. I’ve also modified some of my personal MovNat training to include some more kicks and strikes, as well as quick, efficient get-ups from a variety of ground positions. Chris: I definitely feel better prepared to defend myself. In addition to learning about violence, mindset and realistic scenarios, the course also teaches self-defense techniques. I’m not a martial artist, and it’s unrealistic to base my self-defense on lots of complicated techniques that require hundreds of hours of practice. The Combatives self-defense techniques are kept very simple. They are the kinds of movements I’ll actually be able to use, when my mind is stressed and I’m operating on mostly instinct. Plus, they are also the kinds of techniques I can teach others, which I really appreciate. Sara: The MovNat Combatives program gave me a sense of empowerment. Knowledge is power. Before, I wouldn’t know where to begin. Now I have specific steps I can take as precautions to prevent myself from being a target. Knowledge was imparted in such doable increments by Vic. I now have the tools to cause some damage to my attacker if I have to. The self-confidence of knowing I can take care of myself helps me walk a little taller. I’m not afraid to try new things with new people, and I’m not afraid of being unable to handle a situation if things go wrong. To believe I’m strong enough. To get out of the victim mentality, and not be afraid to hit first and hit hard when needed. Vic kept telling me I’m stronger than I think I am. That’s what I needed, someone to tell me that and show me how, for me to believe it. Zong: It is always good to be prepared. MovNat combative taught me what situations I could face that I haven’t even been aware of. Knowing what some crazy people in this world would do and are capable of doing makes you want to be prepared and walk through your life more alert, but not in a state of panic. Christa: Women should definitely not be intimidated to take this course!!! Yes, it might stretch you a bit, but it will be in a good way – and a pretty practical one! Zong: MovNat Combatives is great for everyone, even experienced martial artists. It sums up all the best techniques and behavioral interventions from all kinds of self-defense systems. The topics that Vic covered were well structured and the exercises that we did were very realistic. Sara: I would recommend highly this course to everyone, and specifically to non-aggressive women like me! It is way more then just fancy punches and fancy choke holds. Everyone should know how to keep themselves and their loved ones safe. It could help save lives, and nothing is more empowering than that! Being female, small and smiley might make me APPEAR like a soft target. But the predator is going to be in for a tough surprise if he ever picks on this ‘soft’ target! Last week, I was in Athens, Greece walking with a man I had just met on the trip for my level 2 certification. He said the way I walk, I look very strong, I don’t look like I would need help defending myself. I would never imagine someone to describe me like that before I found MovNat. That was the best compliment I’ve ever gotten, it makes me so happy. Its all thanks to MovNat Combatives, and all the training I’ve been doing for my elusive pop-up!! 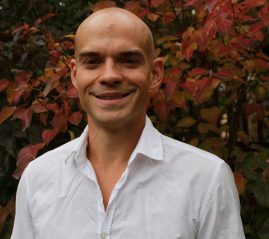 Danny Clark is the COO and Performance Director for MovNat. He is also one of the few MovNat Master Instructors. You can follow him on Facebook and Instagram. Sara is a single mom of 3 wonderful homeschooled kids. She is a NASM Level 2 qualified personal trainer (currently enrolled in Level 3), a MovNat Certified Trainer, and a MovNat Combatives Trainer. Chris Redig is a health and fitness coach. He loves helping people move, look and feel their best by optimizing their nutrition, movement and lifestyle. He is a Movnat Certified Master Trainer (Levels 1, 2, 3, Combatives & Aquatics), Primal Certified Health Coach, and Certified Human Movement Specialist. He currently lives in Denmark to be near his wife’s family. He can be reached at www.chrisredig.com or on Instagram. Zong was born and raised in Vienna, Austria and studied Sports Science at the University of Vienna. He is the General Manager of the first MovNat Facility in Vienna, Sporthalle Wien. He is also a lecturer at the Sigmund Freud University, a Skiing instructor, a Level 2 MovNat Certified Trainer, and a MovNat Combatives Trainer. He also holds a Basketball FECC certification. You can find him on Facebook. Dr. Christa Whiteman is a chiropractor, functional med doc and general movement nerd. She also happens to be MovNat’s Operations Director and Event Manager. Her secret #nerdcrush on Katy Bowman and her work led Christa to discover (and fall madly in love with) MovNat and become a Level 2 MovNat Certified coach in 2016. Ever the dreamer, she is of the opinion that if the whole world MovNatted, she wouldn’t need to fix so many bad backs, hips and necks daily. Christa is also the owner of Evolve Movement & Wellness. You can find her on Instagram and Facebook.